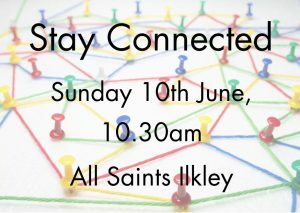 On Sunday 10th June at 10.30am (as the 9.15 service ends) the whole congregation is invited to explore ways in which we can stay connected. There will be an opportunity to connect, or re-connect, to Church Suite to ensure that we are using your personal data in line with new legislation, to explore the different mid-week groups on offer at All Saints – and there are so many – and to sign up for any one of them. There will be refreshments, worship, a time to mingle and chat, discover what happens in Saints and a time to ask questions. This a chance to come together before our move out of Church as development plans come to life.